Your feet are typically wrapped up in socks and shoes or sandals for most of the day. The friction of socks, impact of walking, and moisture from sweating can all do a number on toenails and the skin of your feet. Skin and nail care are two key elements of good foot hygiene. At The Active Foot Store & Spa in San Diego County, our staff strives to help you maintain good foot hygiene so that you can have healthy feet. Whether you’re visiting us from University City, La Jolla, or anywhere in the nation, we’re committed to making your feet look and feel great. Every day, you take thousands of steps. Your feet experience immense forces. Even walking produces forces of three to four times your body weight on your feet. If you engage in moderate to vigorous exercise, your feet experience even more stress. All of this stress means that your feet need extra care and attention. Good foot hygiene helps to prevent itching, blisters, and other foot skin problems. Spending time caring for your feet might also help you to avoid having feet or shoes that smell bad. If you have diabetes or circulatory disorders, foot care is especially important to your overall health. There are many foot conditions that are caused by poor skin and toenail hygiene. Ingrown toenails are a common problem, and they result from not clipping your toenails frequently enough or in the correct way. Fungal infections like athlete’s foot represent another common problem related to poor foot hygiene. The fungus causes intense itching, redness, and flaking of the skin. Foot fungus can also be painful, with the affected area feeling as if it is burning or tingling. Other conditions associated with poor foot hygiene include dry or cracked heels, cracked or missing toenails, plantar warts, and ulcers. Caring for your feet only requires a few minutes of your time each day. 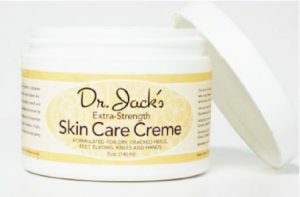 Dr. Jack’s Cream is an ideal solution for people with dry, scaly, or itchy feet. This foot cream penetrates the skin, forming a seal so that moisture stays inside of the skin and does not build up on the foot’s surface. It helps to prevent cracking, especially around the heels. This solution, available at The Active Foot Store, costs $30 for a 5 oz. jar and also comes in a small 1/2 oz. travel size for $2.99. About once per week, cut your toenails with a toenail clipper. Cut them in a straight line. Each time you shower, use a nail brush to clean around your toenails. A pumice stone is good for removing dry skin flakes from your heels and the soles of your feet. Wear shower sandals in locker rooms and other places to lessen your risk of foot fungus. Allow your feet and shoes to air out for a few hours each day. For more inquiries about skin and nail care, contact us. Fill out the form to the right, let us know your questions. You can even request an appointment for a expert shoe fitting with one of our staff. Complete our contact form with a detailed message of any questions or concerns that you might have for us. Our staff will be happy to assist you.